Do You Know About ATT? No, I ain't talkin’ about Unk’s vaunted AEGIS Test Team; I’m talking about a new amateur astronomy magazine, Astronomy Technology Today. This publication, now in its sixth issue, is the most vibrant and interesting mag to hit astronomy in many a Moon. That said, when I heard about Publisher Stuart Parkerson and Editor Gary Parkerson's plans to bring-out an amateur astronomy publication focused entirely on equipment, I thought they wuz NUTS. It’s hard enough to get any magazine off the ground these days—witness the recent demise of Skypub’s much-loved Night Sky—but one focused on such an esoteric subject? FUHGEDDABOUTIT! It would be sure to fail. Wouldn’t it? That’s what I thought initially, but a little cogitating brought me 'round to “just might work.” A small, subscriber-only magazine about our beloved astro-stuff might make it, I decided. And it might not even have to remain small for very long. 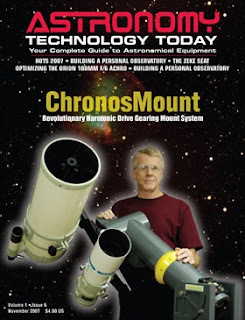 C’mon, admit it: if you’re like Uncle Rod, you mostly read Sky and Telescope and Astronomy for the gear reviews and ads. I do enjoy the observing articles, and especially Sue French’s outstanding "Deep Sky Wonders" column, but I really don’t need all the astronomy news and theory/fact articles. The news is much better delivered by the Internet, and there are plenty of sources including the I-net and many professional and amateur journals that do a good job with the theory. Yep, a gear lover’s digest just might work. What did I imagine ATT would be like? Well, I figgered Mr. Gary would start simple. Maybe with something like Tom Clark’s Amateur Astronomy Magazine—you know, black and white, a few ads, articles cut and pasted from newsletters and other amateur sources. Surprise! Even in its first issue, ATT impressed. There was plenty of color, plenty of advertisements, and plenty of articles written specifically for the magazine by talented authors. Only one thing gave pause: the magazine looked almost too good. Were S.P. and G.P. biting off more than they could chew (anybody but me remember the Deep Sky Journal debacle?)? The magazine looked as good as many newsstand publications, and other than a nod to the gods of economics with the use of pulp paper rather than slick paper, ATT didn’t seem much of step down from any of the other astro-rags. Could Gary keep up this level of quality and keep the mag afloat? Apparently so. Six solid issues have gone out the door since ATT first hit my mail-slot, and it is going strong as witnessed by the excellent November issue. The only fly-in-the-possum fat seems to be occasional distribution problems, but I’m hoping Gary will get this sorted out in short order. Some folks have commented that there’s some manufacturer and dealer fluff onboard. I honestly don’t see too much of that. Even if there is some, there are plenty of hard-hitting reviews in every single issue to more than balance the occasional “press release” stuff. Anyhoo, let me just say this: if you’re a practicing amateur, you owe it to yourself to get over to the ATT website and order yourself a subscription (for an amazingly modest amount). Don’t ask questions; just do it. Uncle Rod says so. Do you know the Messiers better than you do some members of your own family? Have you looked at the “best of the NGC” so many times you’re ready to barf? If so, you’re probably searching around for that next big challenge in amateur astronomy and are likely gravitating toward some exotic lists and catalogs: The Arps, The Herschels, The Hicksons. The Hicksons, a listing of 100 compact galaxy groups put together by Canadian astronomer Paul Hickson, in particular holds a whole lot of attraction for the Advanced Amateur (whatever that is). These small galaxy groups can be very attractive, but, more than that, they are probably the most daunting objects the average Joe or Jane amateur will hunt. I mean, Kats ‘n Kittens, Stephan’s Quintet is one of the BRIGHTER Hicksons. Yup, dim alright. Teeny-tiny-small and dim, with many lurking in constellations most of us don’t visit often—like Aries and Cetus. I’d tried to slowly and cautiously approach the Hicksons a time or two, and had a modicum of success (mostly from the very cooperative skies of Prude Ranch and the TSP with my 12-inch dobbie). I soon concluded, however, that doing all the Hicksons from superior if not perfect sites, or a decent number from my local haunts would require something on the order of a 30-inch telescope. Now, I’ve had aperture fever a time or two, but the realities of the situation given my urban digs and my schedule meant and means a 30-inch dob—or even a 20 or 25—has never seemed overly practical. Invest all that cash in something I’m likely to really get out and use a handful of times a year? I’m not over-fond of the idea of letting a telescope dictate my choice of vehicle, either. No Hicksons for me, then, right? Wrong. The fact is, with today’s galloping technology you can now see just about anything you want in near real time with a 10 – 14-inch SCT. Probably better than one of the Dob Kings in your local club can see it. I’m talking about deep sky video of course. 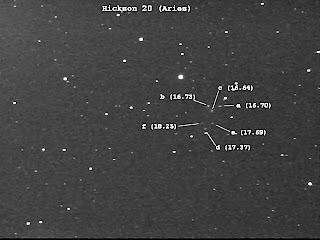 While you can no doubt image every last Hickson with a run of the mill CCD camera, you won’t see much until you process your images at home, and it will take you a long time to image and process ‘em all. The Main Thing, though, for those of us raised on visual astronomy, is that the video put out by Stellacams and Mallincams makes for a much more “real” observing experience then fiddling with a CCD rig and Adobe Photoshop. I’d long heard the same mantra many of you probably have heard from the astro-video mavens: Deep Sky Video Cameras Multiply Your Scope’s Aperture Three Times. Yeah, I had heard that, but wasn’t sure I believed it. An 11-inch becomes a 33-inch? Come on! I’ve owned a Stellacam II for a couple of years now, but until recently I hadn’t got around to putting this aphorism the test. Mostly I’ve used my Stellacam II to show-off the bright DSOs to the public ("That ain't no custard pie, sonny, that's M51! "), and to make something-anything visible from badly compromised urban sites. I did get a taste of what the camera could do last winter when I used it with my C11 from our club’s good—but hardly perfect—site to show B33, The Horsehead Nebula, to my friends. That in mind, I decided to see just how far I could push the thing at the 2007 Deep South Regional Star Gaze, our local Alabama-Louisiana-Mississippi star Party. And what better place to push than with the Hicksons? At this time of year, late fall, many of the groups scattered through Pegasus, Pisces, and the other autumn constellations would be very well placed for inspection with my good, ol’ NS11 and the Stellacam. ‘Course before going on a trip to these very distant shores, travelers need a guidebook. As the popularity of Hickson chasing has increased, some nice observing guides have appeared. One of the best looking ones being Alvin Huey’s The Hickson Group Observer’s Guide. Y’all know how cheap Your Old Uncle is, though, so you won’t be surprised to learn that I gravitated instead to a FREE offering from Reiner Vogel. It’s not filled with observing notes, but does have what I mostly wanted: POSS plate finder charts and stats on each group’s members. Squinting at my monitor and using the POSS plate for H20 on the laptop as a reference didn’t reveal much at first. But a little fiddling with the Stellacam’s gain and contrast soon changed that. “There’s one. Yeaaah…hey, there’s another. And another. Shoot…six li’l galaxies in a dime-sized area of the monitor!” I was convinced, amazed even, and kept the warp drives cranking until my batteries (and me) began to tire and a ground fog moved in at about 2 a.m. All told, over the course of about four hours I captured some 35 Hicksons to DVD. Examining the video at home after the star party was over revealed the Stellacam would show up purty much anything visible on the POSS plates. 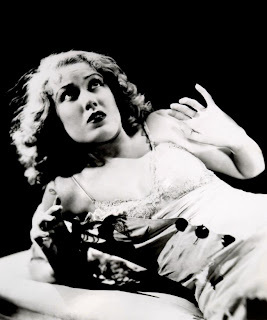 When the seeing cooperated, the video images actually looked a lot like those vaunted glass plates. That’s not the whole story. Lots of folks would like to see Real Dim Stuff like this, but they don’t want to give up the visual experience. How did observing with a monitor compare to observing with an eyepiece? Frankly, the next morning my memories seemed a lot like what I’d have had from a night at the ocular. I tended to forget about humming DVD recorders and chatty computers and just recalled what I saw in near real time (the Stellacam II integrates for about 10 seconds at a whack): “Oh, yeah, that group had the big one that showed spiral arms…the one after that was a string of little-bitties between two bright stars,” and so on. Lots of amateur astronomers in the blue camp shore are feeling it. Anxiety. Uneasiness. Maybe even STARK, STARING, FEAR! What, oh what, is going to happen to their favorite telescope company, and, by extension, to those lovely Meade telescopes they own should they need service? I'm sorry to say we still don't have the answer, though we do have a little more info. —Meade is considering selling/looking for a buyer. —All production is being moved offshore. —RCX production has been halted to allow Meade to address the scopes’ engineering “issues” (teleconference). —RCX production is suspended "indefinitely" (Dealer Letter). —Meade intends to stay in the “high performance” (amateur oriented) telescope bidness. —Meade’s headquarters will remain in Irvine. —It’s “hard to predict” whether or not Meade will be sold. —Meade will continue to support/service its amateur scopes. What does all that mean? I have no idea. I have no doubt, for example, that Meade intends to restart the RCX, or at least wants to. The question will be whether they will be able to—given their financial position—or whether a new owner would want to, given the troubled technological history of the scopes. Frankly, it’s not assured that Meade will be able to remain in the amateur market at all. A new buyer may decide the company needs only its riflescope/departmentstorescope/binocular business to remain profitable (though, in that case, it seems likely the new owner would look for a buyer for the amateur gear side of the house). Finally, Meade may have missed the golden moment for the MaxMount. Bisque and AstroPhysics are both in the process of offering new GEM mounts that are competitive with the Max price and payload-wise. While I'm sure Meade will continue to provide service for its scopes, I'm already hearing that it's hard to get a Meade scope fixed at the moment due to (so says the grapevine) "personnel shortage issues" in Irvine. Let us hope this is a temporary effect of this, uh, "transitional period." It's also not clear from any of the Meade letters/conferences exactly where Meade telescopes will be made. Will the components be produced in China and assembled in Mexico? Will some scopes be assembled completely in China with Chinese components? Where will the amateur scopes fit in? The last word? Wait and see, Meade fans. I suspect we won’t know what’s a-gonna happen to ol’ Blue until the Christmas season is over (shame Meade lost the wonderful Christmas outlet provided by the now out-of-business Discovery Channel Stores). I’ve been thinking about webcams a lot lately. Mainly because, I guess, of that Cuh-razy Comet Holmes, which I’ve been imaging with my li’l NexImage and my SAC7b. Also, Mars is coming back into the sky in a big way as another opposition approaches, and there is no better way to capture detail on that world—or any other world in the Solar System—than with a webcam. That got me reminiscing about the short history of webcams in astronomy, and, naturally, ruminating on what’s and who’s been responsible for the incredible changes they’ve rung-in for amateur Solar System work. Sure, a large part of the reason webcams have caused such a revolution in amateur Solar System imaging is the efforts of dedicated hardware tinkerers like Steve Chambers (he of the “SC” long-exposure mod you’ve heard tell about), and the good folks over at the QCUIAG—Quick Cam and Unconventional Imaging Astronomy Group. Them dudes and dudettes who about a decade ago started wondering if the little “teleconferencing” cameras that were initially and ostensibly sold to enable online business meetings (but which proved more popular with the masses for less family friendly purposes) could be used to image the heavens. Yep, they deserve a lot of credit for the fact that amateur planetary images today are several orders of magnitude better than the amateur (and ground-based professional) Solar System pix of ten years ago. The fact is, however, at least half the credit goes to the software side of the house. Unless you want to take deep sky images with a webcam, hardware-wise one can be used purty-much off the shelf (well, you’ll have to dispose of that itty-bitty lens and the lousy integral IR block filter, but that’s about it). What really made webcams a success was the software, most of it freeware, that your fellow amateurs began developing. When most of y’all think of “webcam programs,” I have no doubt one name comes to mind, “Registax.” Cor Berrevoet’s insanely effective FREEWARE image stacking program certainly deserves a lot of kudos. His “wavelet” filters have allowed many of us to “see” more of the Sun’s little family than we ever dreamed possible. Cor’s program does a lot. One thing it doesn’t do, though, is take pictures. It stacks frames and it processes ‘em (and how), but it doesn’t have any facilities for controlling cameras and acquiring .avi sequences (the little computer movies produced by webcams). Initially, webcam imagers just used the software that came with their Toucams and Quickcams. That worked—I went that route myself for quite a while—but what’s fine for flibbertigibbets playing “I’ll show you mine, you show me yours” over the I-net really is not optimum for astrophotographers. Focus and exposure were more guess-and-try than anything else, and most everything had to be done manually. Want a 90 second sequence of frames of Jupiter? Press the start button and look at your watch. That was the way it was until, finally, the Registax of camera control programs hit the scene: Peter Katriniak’s K3CCD Tools. A level meter that allows accurate and repeatable setting of focus and exposure. Autoguiding capability via webcams and other video-type cameras. And tons more stuff, including extensive image stacking and processing tools. Yes, most of us prefer Registax 4 for frame stacking and image processing, but most of us, could, frankly, get along quite well with K3CCD Tools alone. Which cameras will K3 work with? One of the best features of the program is its long and ever expanding list of supported sensors. These include not only webcams and long exposure modified webcams, but also the Meade DSI and LPI, the ATIK cameras, DSLRs, video cameras via capture cards, digital 8 and DV cameras, firewire cameras, the Lumenera “super webcams,” and more. How mucho? The program began as freeware/shareware, but it’s nice to see Peter reaping at least a little bit of a return for all his hard and continuing work. While, to his credit, he still maintains a freeware version, K3CCD Tools 1, the version most serious imagers will want is the feature-laden K3CCD Tools 3, which can be had (via Paypal) for a very reasonable $49.99. By the way, both versions of K3CCD Tools are currently “Windows only,” I’m afraid. In addition to putting in month after month and year after year of program development, Peter also runs a Yahoogroup for the program and is frequently there himself to answer questions and give advice. Bottom line for me? K3CCD as much as Registax has been what’s kept me fiddling around with my silly little cameras and—sometimes—standing open-mouthed in amazement when my final images appear on the monitor screen. Hey! Since when has your ol’ Uncle steered you wrong about astro-ware? If you fool with webcams, just go get K3CCD, OK? OK!